The base of the recipe is cream cheese and pumpkin, which are both diet approved. The problem with the original recipe is added sugar. I’ve always tried to avoid sugar substitutes as much as possible, but now that I’ve discovered that sugar is basically poisonous to me, the substitutes are probably a better choice. Because I’m kind of new to cooking and baking with sugar substitutes, I set out to do my research to find the best tasting with the fewest health concerns. What I discovered is a new natural sweetener called Swerve . It is comprised of Erythritol (a sugar-alcohol) that is derived from fermented glucose from fruits and vegetables, and oligosaccharides which are sweet non-digestible carbs that are extracted from fruits and vegetables. The oligosaccharides are classified as prebiotics and may actually promote good gut health. The other problem with the original recipe is that it is a dip. What does a person on a low carb diet use to dip with? I love the thin ginger snap cookies that I used to have with it, but they are sadly no longer part of my life. My replacement? Walnut halves. Actually very yummy with the added bonus of a nice dose of healthy fats. Combine all ingredients together and blend with an electric mixer until smooth and creamy. I like to use my Blendtec blender for simple, small batch recipes like this one. If using a blender, add all ingredients to the jar and pulse several times until all ingredients are combined and smooth. 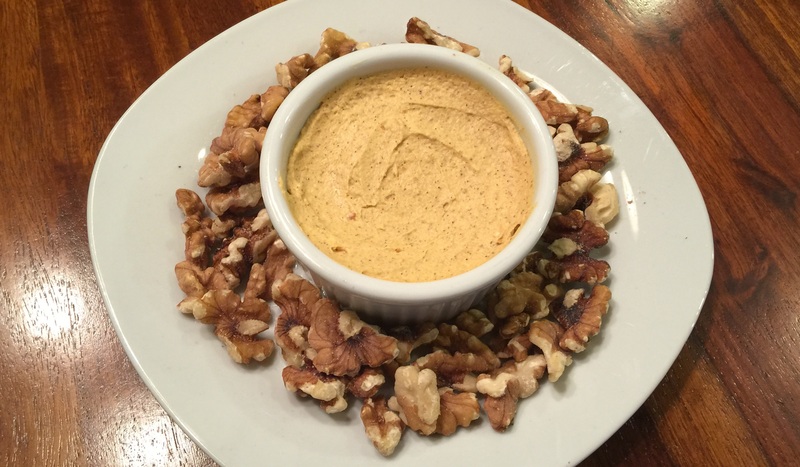 Serve with walnut halves.